My sister asked me to do a Strawberry short cake for my niece who was turning three. I got the idea off this site. I used the Wiltons pan for strawberry shortcake and a heart cake pan for the strawberry. 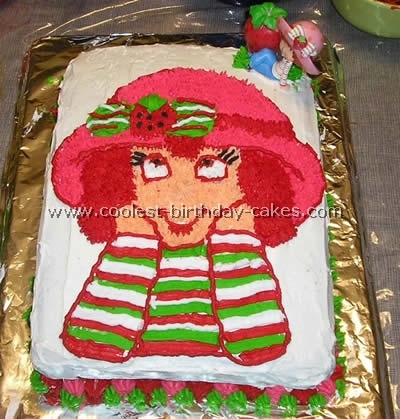 I used the star tip #16 for strawberry shortcake’s face and hair. I used buttercream icing. I iced the strawberry and used stiff icing to make the seeds. I make the strawberries in the hat by using Wiltons white candy melts and colored it and painted it in the molds. I made some cupcakes and decorated troughs around it for a little extra touch! Everyone loved it! It was a big hit! I made this Strawberry short cake out of the Pyrex bowl. I glued the two bowl cakes with frosting. 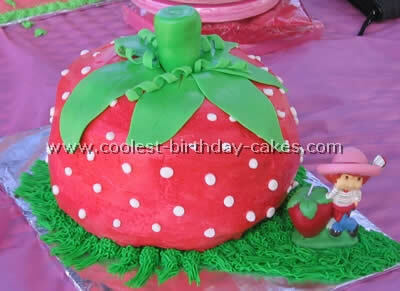 Then I shaved the cake to shape as a strawberry cake. I frosted and used fondant for the stem and I used a candle for the strawberry shortcake figure. I made this Strawberry Short cake for my six year old niece. Strawberry Shortcake is butter cake and the strawberry is French vanilla cake from a box. I used the Strawberry Shortcake Wiltons pan to make her. I used one of the small heart pans for the strawberry. 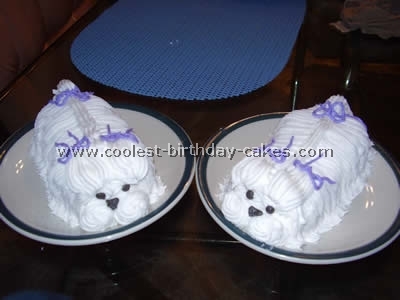 They are both iced in buttercream. When I was done icing I just put them together to make her look like she is leaning on the strawberry. 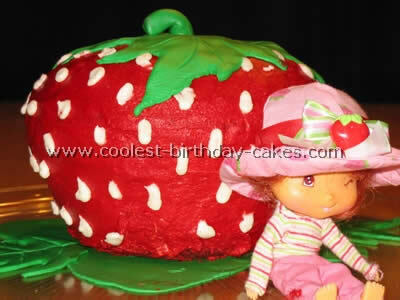 I made this Strawberry Shortcake for my daughter’s fifth birthday as she loves Strawberry Shortcake. I didn’t have a tin to use so made a square cake and a rectangle one. 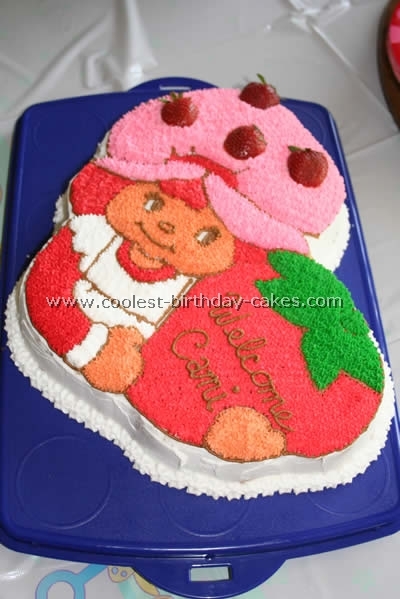 Drew a template of a strawberry on paper, put it on top of the cakes and cut out using strawberry jam to help join the cakes together where needed. Then I iced them with a butter icing recipe for an added touch. I added strawberry essence to the icing. The path is made of crumbled chocolate chip biscuit then decorated with strawberry lollies. The birthday girl loved it! I made this Strawberry Short cake for my daughter’s 3rd birthday. I had a blast doing it. I found it off this web site and just tried to copy it the best I could. 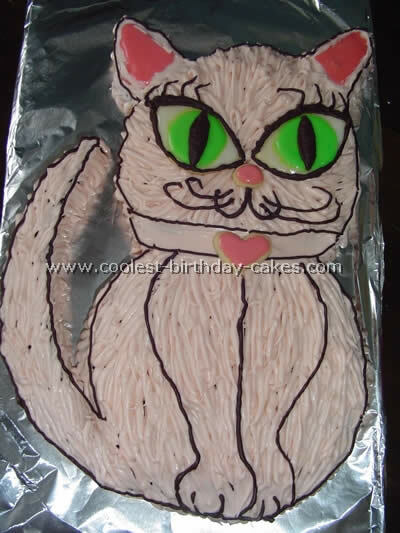 It is not perfect by any stretch of the imagination but everyone raved over it at the party. It just goes to show you with a little time organization and a "little" skill anyone can do this. This was my first attempt at a cake this size. I baked the top two layers with a Duncan Hines "strawberry surprise" box cake mix. It took two to three boxes. Each layer has two cakes in it. The big bottom layer was a Styrofoam layer. I used Wilton’s buttercream frosting recipe and used the pre-made fondant in a box. It took two boxes. I forgot to add the white fondant layer on the bottom. But oh well it still looks good. I also ran out of time to make all those fondant balls around each layer like on other similar cakes. So I just piped them in using a frosting star tip. 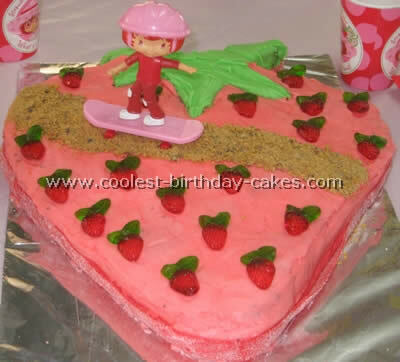 I knew I wanted to make a cake to display one of my daughter’s birthday gifts: a new strawberry shortcake doll with a moped. I chose to keep the cake in a very large pan instead of turning it out like I usually do. I frosted the entire cake first with green frosting. I tossed coconut with green food coloring to make the "grass." I created the dirt road by using brown sugar. (The brown sugar really did look exactly like dirt)! I piped a bright red swirly border around the edge then garnished the "frame" of the cake with gummy strawberries. Finally I placed Strawberry and her moped on the dirt road. My daughter loved this cake and it was one of the simplest cakes that I have ever made! It was really a hit! 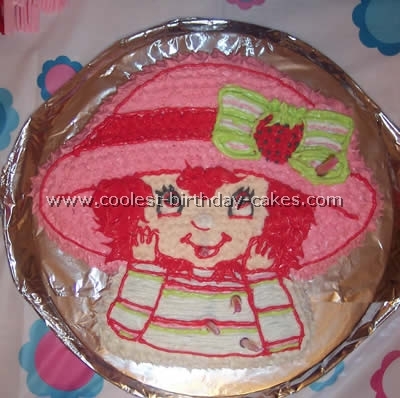 Last year was the year of Strawberry Shortcake for our daughter. 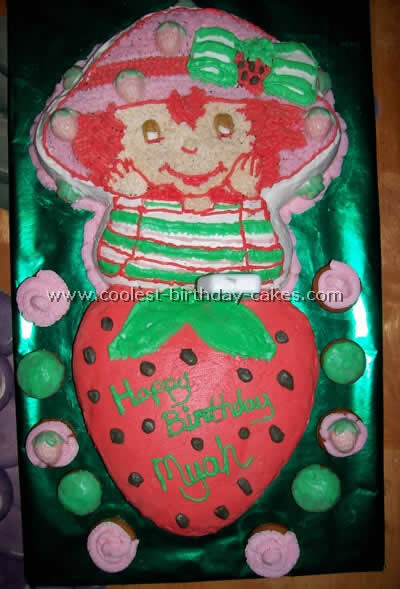 You name it and she wanted the Strawberry Shortcake version – including her birthday party. Always up for a challenge I decided to make her a strawberry short cake rather than buying one. Once it dried slightly I was able to gently pat it smooth. To make the seeds I just piped white butter cream on with a round tip. The bottom green base and top leaves and stem were my first foray into the world of fondant. I used a recipe I found online that had marshmallow as its base. This was surprisingly easy and forgiving to sculpt and work with. Plus it actually tasted great (as opposed to some fondants I’ve had. 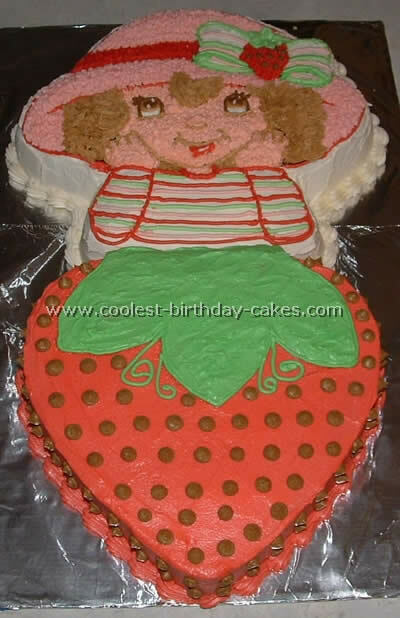 This is an altered version of the Wilton strawberry shortcake seen a couple times on this site. The cake itself is an 8" cake on the bottom 6" middle and 4" top. I used all royal icing and the recipe as well as many of the decorating techniques, strawberries leaves lines, dots were on the Wilton website. The strawberry shortcake friends I got off eBay. They are little 2" trinkets which I glued tooth picks to so they would stay on the cake. The dots I used a small amount of corn starch on my finger to flatten them out. I made the strawberries in advance on a pan and then froze them before applying it makes it easier than trying to make them right on the cake and then you don’t have to use the ones that don’t turn out the way you like. I would suggest making lots extra and using parchment paper on the pan to make them easier to remove and get on the cake. I surprised a friend of mine for her 28th Birthday with a strawberry short cake. She is a classic Strawberry Shortcake collector. For the frosting I used the tradition Butter cream frosting recipe and added strawberry extract. On the sides I used the smooth side of the tip for basket weaving. 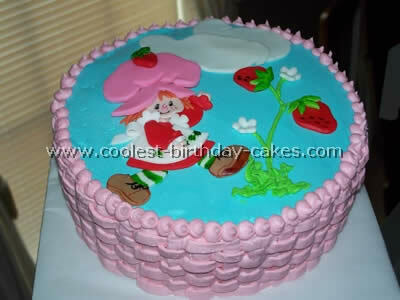 I made Strawberry shortcake, the clouds strawberries and the flowers out of fondant. For the face and the stripes on her legs I used gel food coloring and painted it on. 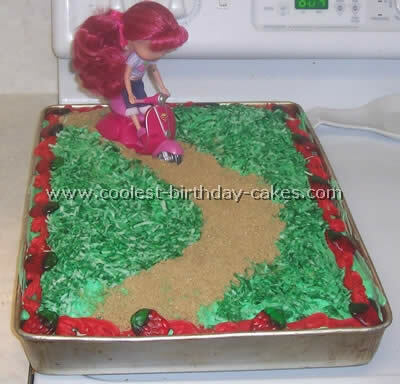 I used a 9" cake pan to make 2 layers and to add to the fun of the cake I put strawberry filling between the layers. 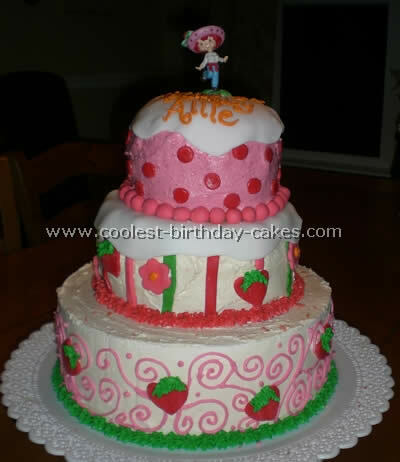 I used the Wilton cake mold for Strawberry Short Cake. I made a boxed chocolate cake mix. Though bringing the egg out of the refrigerator long enough to take the chill off of it and adding an extra egg to the recipe. I also cook the cake at 325 even if it calls for 350. I get a better-textured cake with the three hints I was “secretly” told long ago. My Father-in-law actually taught me to make and frost cakes after he spent years making wedding cakes and family event cakes. I used a tub of pre-made frosting (I was just plain lazy that day). I separated the frosting and made each color of frosting; lime green, pink, magenta, red, black etc. I started with a small flower tip on the frosting bag. I filled in most of the cake with the appropriate colors making small flowers to cover. By adding even smaller flowers in between the first flowers so I didn’t see the chocolate cake beneath. I then made the lines of her shirt. I added small line details in the finishing steps along with black tops from the same tip on the strawberry. This was my daughter’s third birthday so there were three candles in Strawberry’s shirt. I later realized I forgot to use the figure candle I had purchased and made a table decoration with it instead. 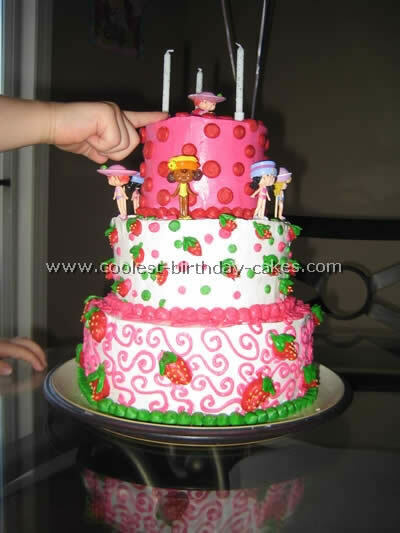 Of course adding the 3ft helium balloon and having this cake mold made the theme EASY. My friends little girl had her heart set on a Strawberry Short Cake cake. We browsed on the internet for a Strawberry Short Cake idea. We baked a cake and then drew out the picture on paper in the size we wanted it, cut it out and used it as a template. After the main figure was traced the rest was done free hand. The Baby Shower theme celebrating my niece’s impending arrival was Strawberry Short Cake. Her mother preferred Vintage Strawberry Short Cake verses the newer version. I found the 1981 Wilton Strawberry Short Cake pan on eBay. I used the Wilton recipe for Buttercream icing and used Wilton icing gels to color the icing. On the hat I used fresh strawberries with the backside cut at an angle so they appeared to be perched on the hat. The cake was relatively easy to make and everyone enjoyed it.